The dark days of December are both the end of one year and the start of the new. As the winter solstice, the shortest day of the year, passes the days again to begin to grow longer. It is time to finish one set of tasks and prepare for the next. Although the December solstice is the start of winter, the coldest weather is yet to come. That honour usually belongs to February so we can still get out into the garden before bad weather stops play. In the ideal world, the efficient gardener will have completed his jobs outdoors and can look forward to sitting with the seed catalogues, his diary and plan his sowings for next year. The rest of us who are merely mortal may have a little more to do! It is the traditional month for ordering seeds but before doing so check what you have left over from the year before. When you buy seeds in the UK they will have a 'use by' date on the packet. Often they will be in a sealed foil packet within the main packet. This excludes air and light which keeps the seed fresh. Digging over can continue, when weather allows. Particularly with clay soils, digging when the soil is wet and sticky can do more harm than good. It's also harder work. As a rule, if your boots become heavy with soil sticking to them it's too wet to dig. Stake any young trees and tall brassicas to prevent wind rock damaging them by loosening the soil around their roots. Ensure compost bins are covered to prevent excess rain leaching the nutrients and to keep some of the heat of decomposition in. Leaves should still be falling so keep adding them to your leafmould pile, creating your future humus. Remember the pigeons will be on the look out for food, so check the nets on your brassicas to keep them away. It's worth removing any yellow leaves from your winter brassicas, they are doing no good and only encourage diseases such as botrytis. Protect any heads of cauliflower and broccoli by bending over the outer leaves. Any crops in cloches or coldframes will need extra protection if the weather does turn severe. Cover with fleece, sacking, even old net curtains to provide that little extra protection that keeps them alive. 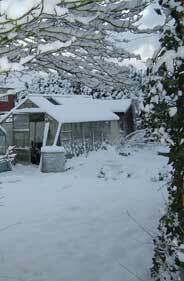 In the greenhouse, if it is kept frost free, you can continue successional sowings of winter salads. Ventilate the house on warmer days to prevent moulds from becoming established. December is a good month to go through the shed. Check over your tools, repairing or replacing as need be and check your machinery. If you have a rotovator, now is a good time to service it or send it to your local garden machinery specialist before the spring rush starts. You may even get a better price! John Harrison is the author of Vegetable Growing, Month by Month and The Essential Allotment Guide amongst others. His home is in Cheshire from where he runs the Allotment Vegetable Growing web site and grows his own fruit and vegetables on his two allotments around the corner. A good time to buy Lawnmowers at good prices!